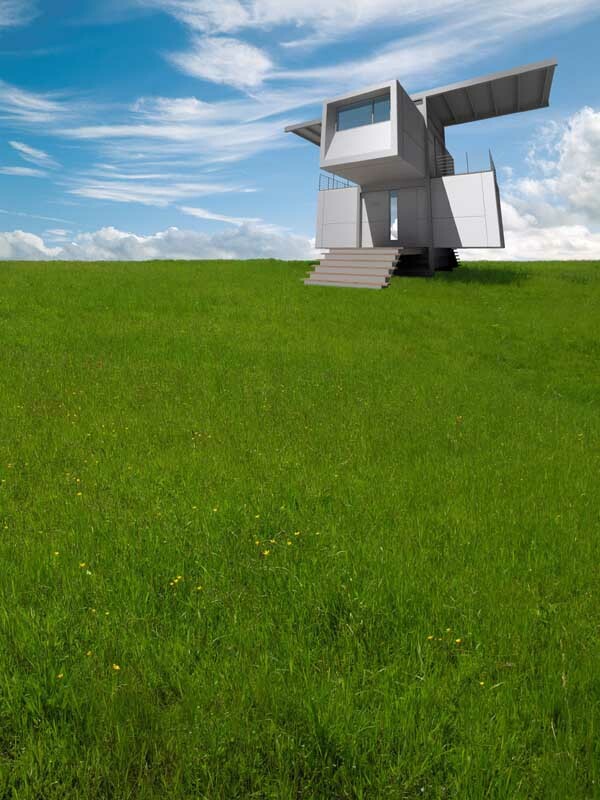 The zeroHouse is a small, prefabricated house that can be easily shipped and quickly erected. It features a full kitchen, bath, and all elements necessary to comfortably support four adults. 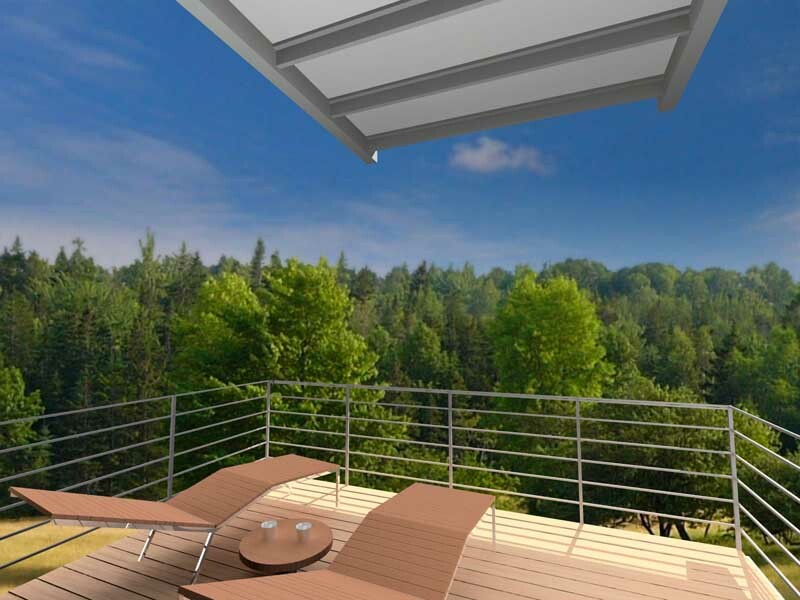 What sets the zeroHouse apart from other prefabricated structures on the market, however, is its ability to operate independently, without the need for any external utility or waste disposal connections. 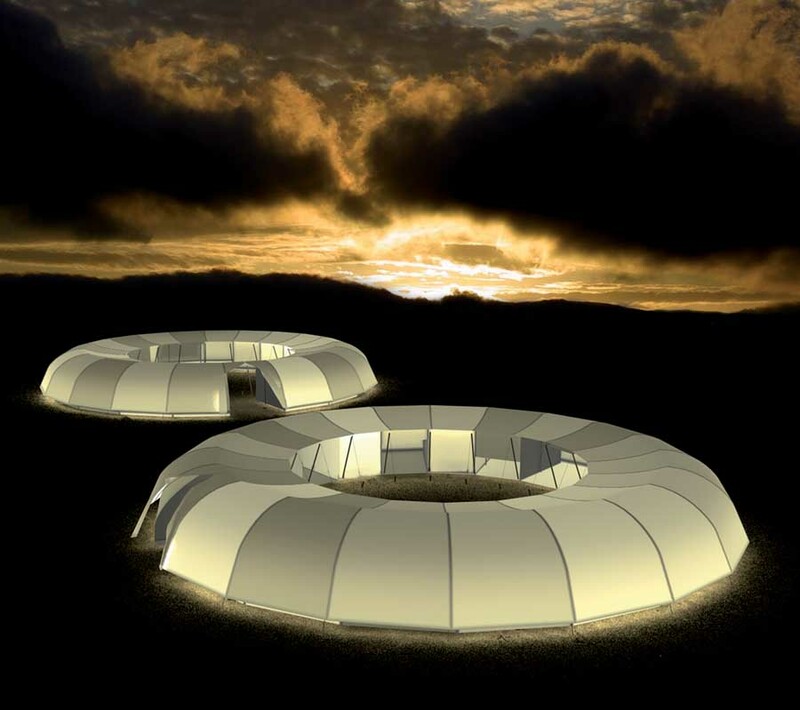 The zeroHouse can be used in many applications, including residential uses in remote or ecologically sensitive locations, as ecotourism resort units, or as living or office modules for remote employment such as mining, construction, or relief agency uses. 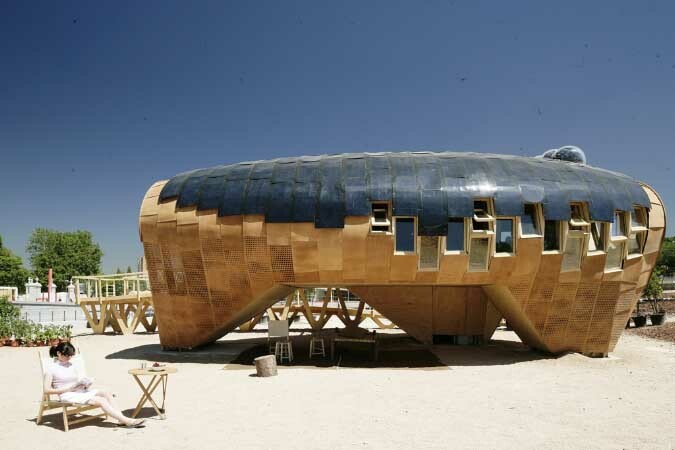 Technical requirements were a major determinant in the initial design and final appearance of the zeroHouse. 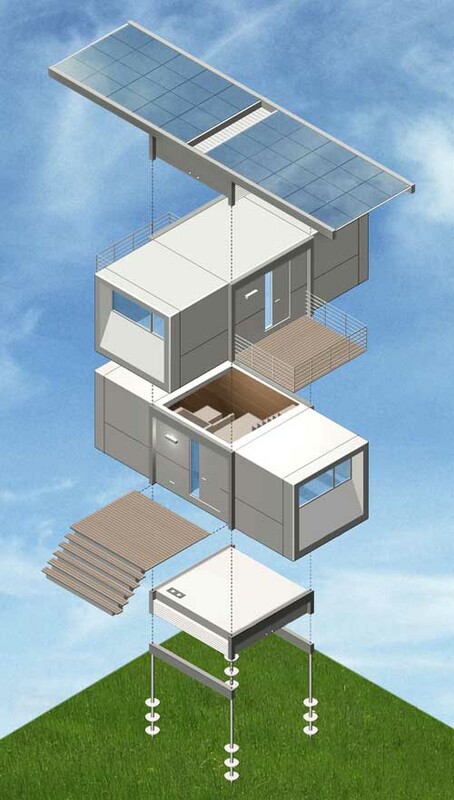 Unlike many off-the-grid houses, the zeroHouse integrates all systems to work in concert to improve efficiency, thus the size, arrangement, elevation and orientation of many of the components was critical to the proper function of the house. Additional constraints were introduced by transportation and erection limits. The final configuration of the zeroHouse achieves full operational independence of all major systems: power supply, water collection, and waste recycling. zeroHouse generates its own power. High-efficiency solar panels produce power and store it in an onboard bank of batteries. Fully charged, zeroHouse can operate continuously for up to one week with no sunlight at all. zeroHouse collects its own water. A rainwater collection plane gathers and diverts water into an elevated 2200 gallon cistern. Plumbing fixtures are gravity-fed, eliminating the need for power-consuming pumps. zeroHouse processes its own waste products. All organic waste is processed in a compost unit located beneath the house. It converts the waste into clean, dry fertilizer that needs to be removed only twice a year. All functions of the house are monitored by an array of sensors, and regulated by a “house brain” that can be controlled through any laptop computer. zeroHouse is fully customizable for personal usage patterns, from weekend getaway to extended-stay living. zeroHouse is designed for comfort as well as efficiency. Each house features a fully-appointed living room with modular wraparound couch, 42” LCD TV, and ample built-in storage. The kitchen has a full array of high-efficiency appliances, including an induction cooktop, microwave oven, and full-size refrigerator. The dining area includes a restaurant-style booth, and comfortably seats four adults. Upstairs, a covered deck provides the perfect rooftop perch for outdoor living. Two bedrooms come furnished with king-size beds, window seats, and large closets. The bathroom, which features a large shower, full vanity, and a porcelain low-flush toilet, opens onto its own private sun-deck with outdoor shower and lounge chairs. zeroHouse is fully climate-controlled, with a high-efficiency air-conditioning / heating system and separately zoned sleeping and living areas. The walls, roof, and floor are all insulated with closed-cell structural foam, and achieve a thermal resistance rating of R-58. The full-wall windows in each room are triple-insulated and fabricated from low-e heat-mirror glass. Exterior doors feature vacuum-sealed aero- gel panels to maintain maximum thermal performance. Finishes within the house are selected for beauty and durability. Countertops, sinks, and bath surfaces are seamlessly fabricated from solid-surfacing material. Natural-fiber fabrics and carpet are used throughout the house, and bio-based wood composite wall and ceiling panels can hold up to heavy use and retain their appearance. Fully-dimmable LED lighting built into the wall and ceiling panels will last for up to 100,000 hours of continuous use. 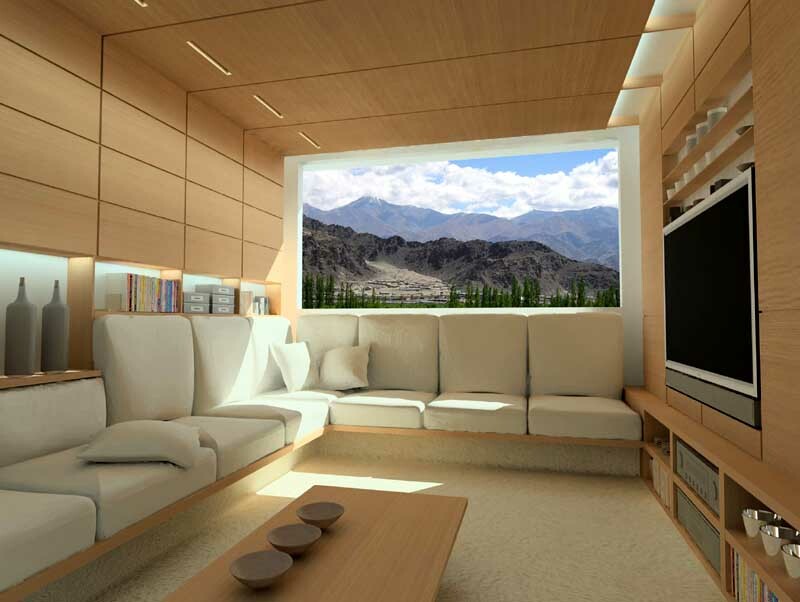 The interior of each zeroHouse can be customized with many material and color combinations. zeroHouse can be located almost anywhere. Two flatbed trucks carry all the zeroHouse components to the site, and it can be erected in less than a day. It can be installed in places that would be unsuitable for standard construction including water up to ten feet deep, or on slopes of up to thirty-five degrees. zeroHouse employs a helical-anchor foundation system that touches the ground at only four points, requires no excavation, and only disturbs the ground to a minimal degree. It is especially suitable for use on environmentally-sensitive sites, or locations where no permanent structural elements are permitted. zeroHouse is nearly maintenance-free. The exterior is clad with integrally-colored body panels that are impervious to scratching, denting, mildew and fading. Steel frame components are bonded and powder-coated for corrosion prevention. No painting or resurfacing is ever required. The photovoltaic panels, solar hot water panels, and other devices are rated for indefinite use and do not lose efficiency with continuous exposure. zeroHouse can be left uninhabited for extended periods of time. The house can be put into a self-regulating “hibernate” mode which conserves power while maintaining necessary housekeeping functions. zeroHouse is also extremely secure. All windows feature laminated “Sentry-Glas” for impact and penetration resistance. Exterior faces of doors are Kevlar reinforced, and fully-mortised locking systems are used throughout. A continuous web-based house monitoring system is also available. 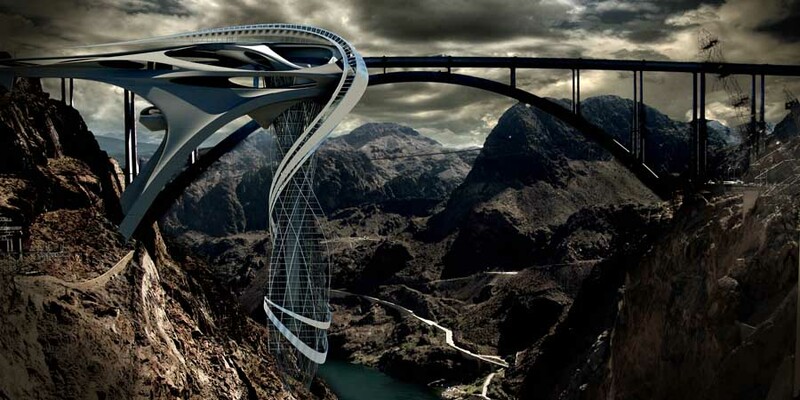 The tubular steel frame of zeroHouse can withstand winds of up to 140 mph. The living modules feature flexible attachment points to the frame to allow for deflection and movement without damage. The solar panels are independently anchored and can detach in extreme wind conditions to prevent damage to the rest of the house. Exterior cladding panels are installed in a pressure-equalized rainscreen configuration that minimizes the possibility of water penetration from driving rain. In many locations, the zeroHouse will produce electrical power in excess of what is required to operate the house. This excess energy can be used to operate any number of remote devices, including the charging of electric or hybrid vehicles. 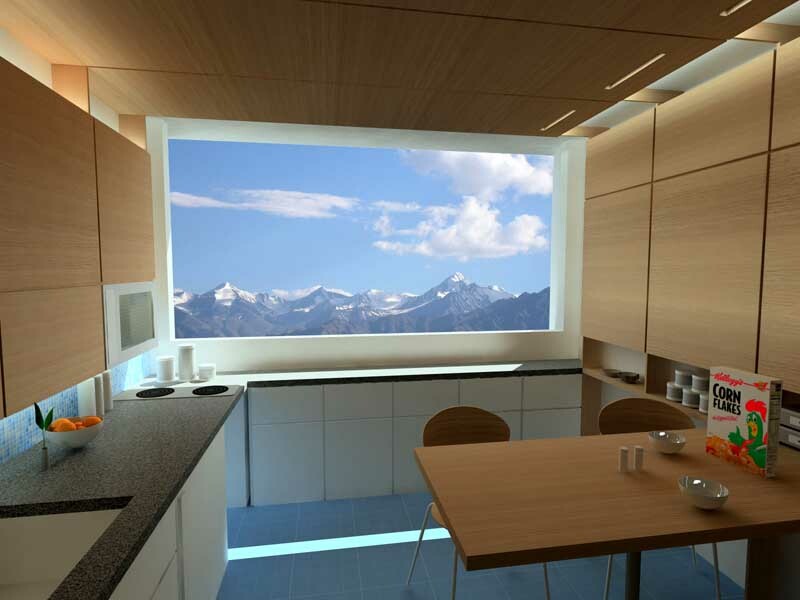 With the zeroHouse, completely fossil-free living is a possibility. 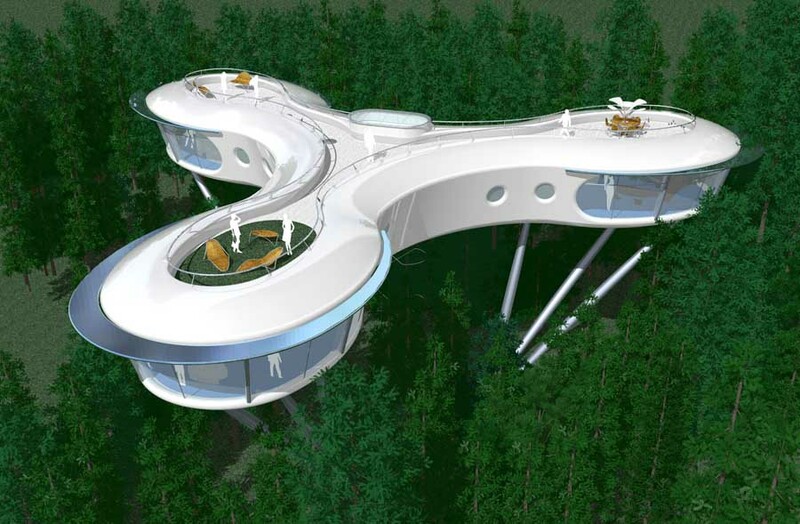 The zeroHouse is being marketed worldwide. It has been designed to work within an operational range of 36 N to 36 S latitude for year-round occupancy, and 47 N to 47 S for partial-year occupancy. 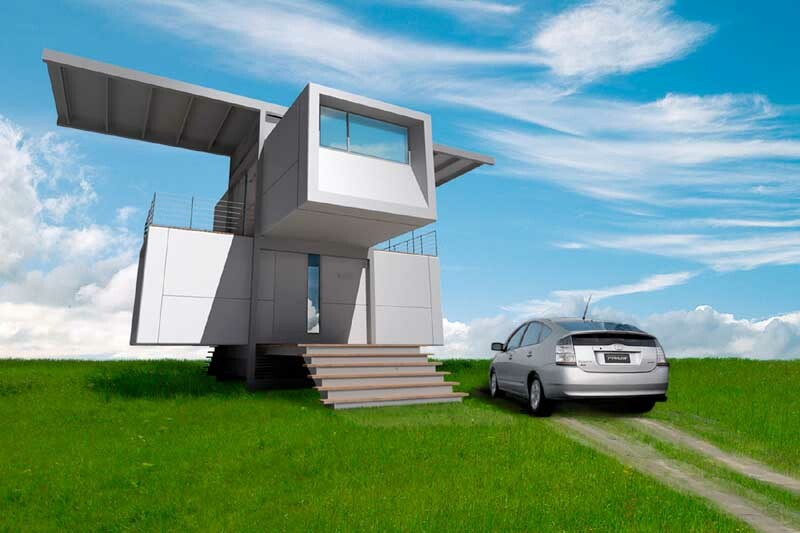 The zeroHouse has been designed for use in a wide variety of site conditions. Due to its unique foundation system, it can be installed on land with a slope of up to 35 degrees, and in water to a depth of ten feet. It touches the ground at only four points with minimal disturbance, making it appropriate for environmentally sensitive areas. The flat-mounted solar array allows the house to be oriented in any direction to take advantage of localized views and access paths. A flexible structural exoskeleton provides resistance to wind loads of up to 140mph. The house was designed to meet the most restrictive aspects of international and local residential codes. Stair widths, railing heights, plumbing configurations, and other items have been developed for maximum applicability worldwide. The design and engineering work was financed by a venture capital group with the intent of creating a start-up company to produce and market the zeroHouse. This group has a long track record of supporting design-oriented and sustainable business ideas. Sufficient seed money has been provided to fully design the house, produce all construction and engineering documents, and create a cost analysis and business plan. Capital is currently being raised to produce a full-scale working prototype. The intent is to use the documentation and prototype to generate funds necessary for a full production run. Based on initial studies, we are hoping to sell the completed zeroHouse for approximately $350,000. All architectural and engineering documents have been completed, and a preliminary cost analysis has been completed. The schedule for initiating construction of the prototype is as of yet not determined, but an early 2007 start date is being anticipated. The zeroHouse is a small (650 s.f. 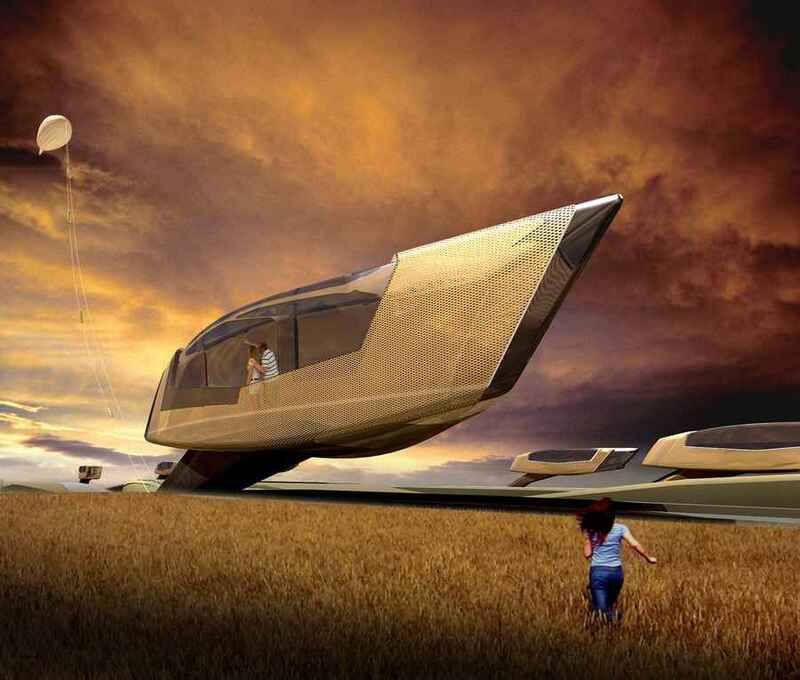 ), comfortable house that can operate autonomously, with no need for utilities or waste connections. It generates its own electrical power, collects and stores rainwater, and processes all waste. The house is prefabricated, and able to be shipped via two flatbed trailers. It can be field-erected in less than a day. The two-bedroom house is configured for support of up to four adults, with a full bathroom, kitchen / dining room, and living room. Outdoor living is featured, with two elevated exterior terraces and an outdoor shower. The house is fully air-conditioned and heated.